A person’s home should be their sanctuary – where they can unwind free of stress and worry – and a place where families can thrive. The CALA Homes properties at Milltimber Grange have been designed with not just style, but comfort and serenity, in mind. From top to bottom, inside and out, each home will create a space where individuals and families can relax. 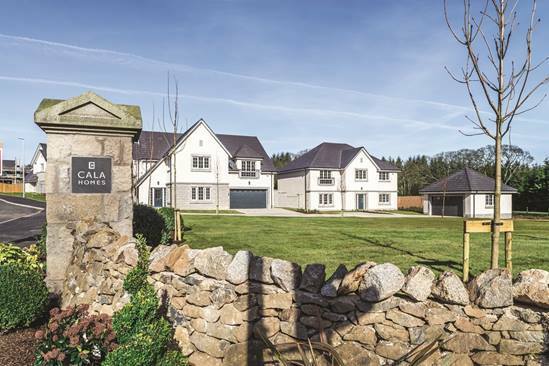 Fraser Carr, sales and marketing director for CALA Homes (North), said: “Oldfold Village offers homebuyers a unique opportunity to be part of a burgeoning community in an idyllic and highly sought-after area of Aberdeen. “The selection of homes, development landscape and showhome interior has been carefully considered to complement the stunning backdrop of Milltimber and provide homebuyers with a peaceful setting to enjoy coming home to each day. Each house includes uPVC double-glazed windows and double-glazed insulating glass sealed French doors that block outside noise ensuring peace and tranquillity within the home. One of the most important factors of wellbeing is a good night’s sleep. And for growing children and teenagers, getting their eight hours can be vital for their development. The bedrooms at Milltimber Grange’s Lewis are decorated in restful colours, with a double Georgian window in the master bedroom to let in lots of natural light and fresh air. The Mental Health Foundation, an organisation which uses research to champion causes that aids mental health and wellbeing, says that evidence shows that good nutrition is “essential” for mental wellbeing. And a kitchen which allows families to cook well-prepared, healthy meals makes ticking this item off the wellbeing checklist even easier. All of the properties at Milltimber come equipped with a stylish and functional kitchen designed by Nobilia German Kitches, and appliances from Siemens (appliances vary between different properties), making a healthy meal is easy to create. The kitchen also includes dining space so that families can eat together and share their day. Private garden space for each home and communal green allows families to get fresh air and exercise. But it’s not just providing a home and garden when your family can thrive, the community plays a big part of a person’s wellbeing. Milltimber Grange is designed for families to live together in an idyllic village setting away from the hustle and bustle of life, whilst staying in close proximity for work and hobbies. For more information, visit the CALA Homes website.